Without adequate housing we cannot learn or form rich lives. Many believe that Aboriginal people did not build permanent dwellings or shelters. But is that true? Age of the oldest stone house found in Australia . Proportion of Aboriginal people owning or purchasing their home. Same figure for non-Aboriginal Australians: 72% . Fortnightly rent paid by an Aboriginal family in Alice Springs for an open-sided shelter with no electricity, no toilet, no bathroom and just one tap . Did Aboriginal people build permanent houses? A common stereotype is that Aboriginal people were 'nomads' and never built permanent shelters. The opposite is true. An area near Portland in southwest Victoria has evidence of volcanic stone huts that date back thousands of years . The Gunditjmara Aboriginal people of that area developed an 'aquacultural system' made of fish traps and weirs which is thought to be among the world's oldest , covering an area of 100 km2, thus "dispelling the myth that Australia's Indigenous people were all nomadic" . On the opposite end of Australia, on the Dampier archipelago off Australia’s north-west coast, archeologists found evidence of stone houses dating back 9,000 years . The excavation of the circular stone foundations showed occupation was maintained throughout the ice age, and evidence of human occupation dating back 21,000 years. The architecture of Aboriginal houses built prior to invasion depended on climate, natural environment, resources available, family size and particular needs of the Aboriginal nation of that area. As you can see from the image below fire was always present around gunyas as it was used to drive away snakes and mosquitoes and other insects, as well as for cooking and heating. Author Paul Memmott has written the first book about "the Aboriginal Architecture Of Australia" exploring the range and complexity of Aboriginal-designed structures from minimalist shelters to permanent villages. "Gunyah, Goondie and Wurley" (which are all names of (semi-)permanent Aboriginal structures) aims to introduce the lay reader to the subject and provide insight into the lifestyles and cultural heritage of Aboriginal peoples. According to Paul Memmott, many of the huts and shelters Aboriginal people built were dome structures. In the rainforest area around Cairns, in Queensland, where there was heavy rain for much of the year, people would occupy such villages for up to a year. Some of the houses had triple layers of cladding and insulation. In western Victoria, Aboriginal people built circular stone walls more than a metre high, constructing dome roofs over the top with earth or sod cladding. 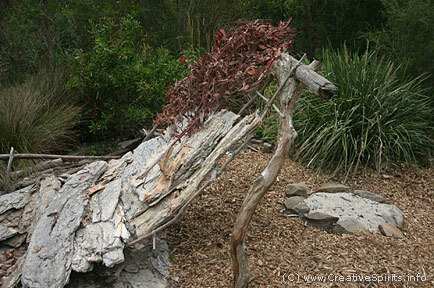 Replica of a temporary Aboriginal shelter. This is a 'gunya' that was rebuilt in the Botanic Gardens in Sydney. The interpretive sign fails to mention that Aboriginal people also built permanent houses, a fact lost on many people learning about Aboriginal culture. There are many Aboriginal words describing 'houses'. Since there were many hundred Aboriginal languages in Australia the number of words we know today is but a fraction of the abundance of words used. Some words are gunya (gunyah), wiltija, mia-mia, nganu, goondie and wurley. Watch the findings of a group of students who researched the stone huts of Lake Condah, in south-west Victoria, as an example of permanent residency. What is "home" to Aboriginal people? 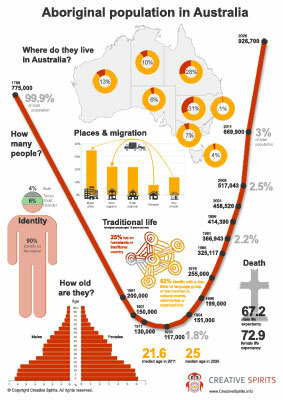 Aboriginal people have a different understanding of 'home' than non-Aboriginal people. With their strong attachment to traditional lands and extended kinship systems they don't think of 'home' as a particular dwelling. When Aboriginal people move in with households that are related to them, for example in order to escape domestic violence or other family problems, it is not culturally appropriate to think that they are 'homeless' and have no fixed address . 'Home' is not understood in a different way than before when they were living at the other home. A common misconception among white people is that Aboriginal people willingly destroy the houses they are given by the government. Sara Hudson from the Centre for Independent Studies in St Leonards, NSW, says that "although vandalism to houses is evident in some communities, the widespread assumption that Aborigines destroy their houses is false" . Rather, "studies conducted over a seven-year period (from 1999 to 2006) found that the major causes of 'house failure' were lack of routine maintenance and faulty construction and design." "Of the 4,343 houses surveyed in 132 communities, only 11% passed national standard safety. In 50% of houses, there was no tub or bath to wash a child in, and only 35 per cent of houses had a functioning shower." Architect Paul Pholeros has 30 years' experience in Aboriginal housing. He says that 60% of housing problems arise from poor maintenance, 25% from poor initial construction and only 8% from damage and abuse by its tenants . Australia-wide Aboriginal people suffer from inappropriate and overcrowded housing conditions. Sometimes houses built by the government are left in such a poor state that they are uninhabitable. In Western Australia a report found that there was an 'epidemic' of abandoned houses in remote communities which were in such a bad state of disrepair that they were a risk to health and safety . About 90% of homes in 130 communities throughout WA needed 'major repairs', prompting the federal government to allocate almost $2 billion for 2008-2018 for Indigenous housing in Australia .Builders cause many housing defects when they use solutions that work in coastal areas but not in remote Australia, architect Paul Pholeros says . Heater elements which operate for years in water used in coastal areas of Australia are covered with a solid salt crust after a few years of operation in Central Australia. Only 30% of the showers he has seen work, only 10% of the houses had safe electrical installations. Builders are poorly supervised during the construction process, Mr Pholeros told, and houses not tested after completion. Some builders "take off after 95% of the work is done" leaving the house incomplete: tabs without water, toilets without drains . Some people pay rent for a house that has no running water, no toilet or shower. It comes to no surprise that Aboriginal people are fed up with their housing conditions. On July 15, 2009 dozens of Ampilatwatja people, three hours north-east of Alice Springs in the centre of Australia, abandoned their community altogether because the sewerage system failed. Raw sewage flooded the streets, a condition described as "the worst he's ever seen anywhere in the nation" by Adam Giles, the Northern Territory opposition spokesperson on Indigenous Policy . Consequently many community members including elders and children walked off, camping in the desert in the dead of the Australian winter. "This is as significant an event to them as the Gurindji Walk-Off, " said Federal Country Liberal Senator for the NT, Nigel Scullion . Aboriginal housing has a strong link to Aboriginal health. "Decades of reports and research clearly indicated that housing and health were closely linked and should be considered as on issue," says Craig Somerville, Executive Officer of the Aboriginal Health Council of Western Australia . 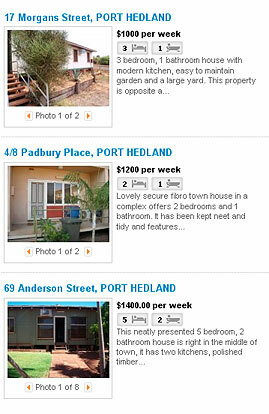 Rent for houses in Port Hedland ranges from $1,000 to $2,000 a week. In mining areas such as the Pilbara region in northern Western Australia very little accommodation is made available  leading to overcrowded houses. When the resources sector booms, the cost of renting a house skyrockets, and items like a toasted cheese sandwich can cost up to $12. If men who with their families live in public housing get a job which pays over a certain threshold Homeswest, the Western Australian public housing organisation, "kicks them out and tells them they've got to go to private rental" . But a usual rate for houses is more than $1,500 a week—too much for most Aboriginal families. As a result many families haven't got a house at all and are homeless. It doesn't take long for health problems to follow. An inquiry in 2009 found the private rental market was rife with racism, both direct and indirect . Property managers racially abused tenants, property owners were "racially selective" of applicants, and the wording of property managers' correspondence was complicated and inaccessible. Complicated complaints processes and tenancy documents that worry tenants are a continuing problem, and worsening, due to the shortage of interpreter services. But identification guidelines of the Department of Housing have been improved, helping Aboriginal people access rental homes. Racial discrimination is another issue. 'Many Aboriginal families complain of difficulty finding rental properties. Aboriginal people who feel they have been discriminated against can make a complaint to the Equal Opportunity Commission. In Queensland, Aboriginal people cannot buy their own properties. Aboriginal communities in that state are governed according to a Deed of Grant in Trust (DOGIT), under which residents must live in social housing and are unable to buy property . In some communities 99-year leases, set up by the government, prevent properties from being sold. The restrictions on private ownership means residents have few options to find work locally and are not encouraged to work towards self-determination. Affordability is a major stumbling block for Aboriginal home ownership, with big gaps between what the state government insists houses in the communities are worth and what local Aboriginal people feel the can and should pay . The government valued a 3-bedroom house in Mapoon at $326,000, a 4-bedroom house at $350,000. But community members can only afford houses in the range between $140,000 and $185,000. In 1963, in Queensland, the Country Party Government of the day ordered police to burn to the ground Mapoon's mission and houses--built and owned by the locals . Proportion of Aboriginal youth who are homeless in the Northern Territory; in South Australia: 14%, in Western Australia: 49%, in Queensland: 17%, in NSW: 13% . Percentage of Perth’s homeless that are Aboriginal . Number of Aboriginal people who are homeless on any given night . A report shows that what drives Aboriginal people into homelessness is similar to non-Aboriginal people, but there are some significant differences . Aboriginal people can suffer from spiritual homelessness, a term which describes dispossession and forced removal from homelands and family . Another difference is the extended family network of Aboriginal people and the obligations that the people of this network expect. Causes for Aboriginal youth homelessness include family breakdown, a reduction in public housing and the housing affordability crisis. One family decided to leave their community after the local school was shut down to find better education for their children. They decided to go to Perth, but found themselves homeless. Not a single government agency or service could assist them . They had to live in tents near a busy highway. What's the government doing about housing? Money the government spent to inspect or fix an average of 0.9 items in each of 2,900 houses during the Northern Territory intervention . Per-item expenditure: $30,651. Money company Health Habitat spent to inspect or fix an average of 17.3 items in each of 5,500 houses . Per-item expenditure: $267. Money the government spent in the first 18 months of the SIHIP program without building a single house . Percentage of SIHIP's funds which were spent on administration . Number of houses built in remote Northern Territory communities before SIHIP . Number of houses built in remote Northern Territory communities in the first two years of SIHIP . Maximum number of people per 3-bedroom house under the SIHIP. Same number under the Aboriginal-controlled Indigenous Housing Authority of the NT (early 2000s): 7 . The Australian government is well aware of the dire situation of Aboriginal housing. In 2009 it decided to invest A$5.5 billion into the Strategic Indigenous Housing and Infrastructure Program (SIHIP), which then was the largest Aboriginal housing program in Australia--ever . "In 15 months [SIHIP] hasn't delivered much at all, unless you count the limitless tangle of committees, reports, acronyms, consultancies, policies and, of course, white-collar whitefella jobs. Money has been spent but few houses produced, if any. The number may be none, as many commentators aver, or 102, which is the best gloss even the relevant minister [for Indigenous Affairs], Jenny Macklin, can find for it. Either way, it's pathetic. And the mere fact that it is virtually impossible to check these numbers is itself indicative of the problem." The first two houses were finally handed over in February 2010 in Wadeye, an Aboriginal community 250km south-west of Darwin, at a cost of $450,000 each , indicating the high cost of delivering houses to remote communities. A report in November 2011 found that the average cost of a new house was about $590,000, and the number of existing houses would not bring down the average occupancy target to 9.3 people per house . Only 350 houses had been completed, and 275 were under construction. Refurbishments cost an average of $75,000 a house under SIHIP while the same work could have been done for an average of $24,600 . Think these figures are an exception? The government's Home Ownership on Indigenous Land program spend A$10 million on administration to provide A$2.7 million for just 15 loans. The program's target were 460 loans. Between 2006 and June 2010, 45 homes had been constructed at a cost of A$25.5 million—but not a single one of them was sold to the Aboriginal community . The program's total cost was then A$42.7 million. SIHIP renovations: "Six-year-olds could do better"
Nigel Scullion is the Senator for the Northern Territory and Shadow Minister for Indigenous Affairs. Here is his first-hand account  of houses "renovated" under the SIHIP in Wadeye, a remote Northern Territory community. "I have inspected more than 30 house refurbishments and rebuilds completed under Labor's hopeless Strategic Indigenous Housing and Infrastructure Program. The workmanship is poor and none of the work is worth anywhere near the government's target average for the program of $75,000 per refurbishment and $200,000 per rebuild. I have seen paintwork in these houses that six-year-olds could do better: holes in walls have been painted over, big gaps around light switches and lots of paint on the grass instead of on buildings. One Wadeye rebuild had a small strip of concrete added around the veranda and some minor work such as plugging up a hole in the roof with silicon, which, to be generous, might add up to $20,000 - nowhere near the program minimum payment of $100,000. The kitchen sink and cupboards were replaced with metal shelving with no cupboard doors and nowhere to safely store food. The bathroom was a mishmash of different coloured and different shaped tiles, the practice being to replace broken tiles with whatever is handy, not a matching tile. In any normal public housing estate the builder would be told to do it again, but not in Wadeye. I discovered that refurbishments do not include floor coverings, leaving families to live on bare cement floors."